(a) Using a screwdriver, remove the 2 clips labeled A and 2 clips labeled B, 4 clips labeled C and finish plate. (a) Remove the 3 clips, screw and mudguard. HINT: Use the same procedure described for the LH side. (a) Put protective tape under the quarter panel. (b) Remove the 6 screws, 4 nuts and 2 clips. 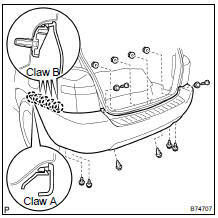 (c) Using a screwdriver, disengage the claw labeled A, 4 claws labeled B and bumper cover. (a) Remove the 6 nuts and reinforcement. (a) Remove the 3 screws and side retainer. (a) Remove the screw and bracket. (a) Install the bracket with the screw. (a) Install the reinforcement with the 6 nuts. (a) Engage the 10 claws. 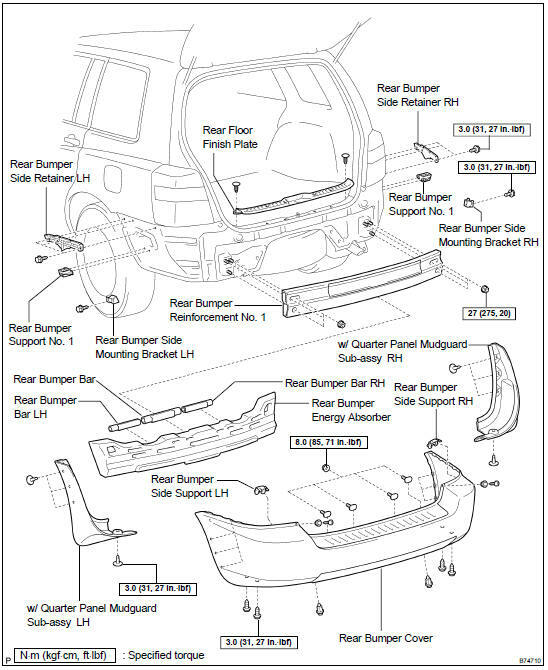 (b) Install the bumper cover with the 2 clips, 6 screws and 4 nuts. (a) Install the mudguard with the 3 clips and bolt.